As a blogger and a full time corporate professional, I am always on a hunt to find innovative websites or brands that genuinely work towards the fashion needs of a working women professional. So, when I recently came across this site StyleNook, I was rather intrigued by their whole concept wherein you get your own personal stylist to handpick clothes for you that are stylish and professional and most importantly getting a well curated box of apparels to suit your personal style and work environment needs. So the process starts by filling up a detailed questionnaire on my personal style preferences along with my exact job profile which kinda helps in mapping my style quotient to its closest best. What I really liked about this process, is that unlike other questionnaire, I wasn’t bored to fill it up. Given that the questionnaire was a mix of both variables as well as attributes, with a good blend of visuals which helped me understand my needs better! Fixing my budget for the curated box was another thing that I absolutely loved as it ensured that I didn’t drill a hole in my pocket and that it lets you pretty much stick to your budget! And once I was done with it all I had to do was sit back, relax and wait for my stylist curated box to arrive – which pretty much took like 7 working days. First Look at the STYLNOOK BOX – Now, I will be fairly honest with you about what I really felt about the box! To begin with, the first thing that caught my attention was how personalised the packaging was which indeed made me feel special. Wrapped in a pink butter paper, the box looked rather an expensive one. About the Products – What astonished me is that how close they got to figuring my style out and curate a box that pretty much relates to my liking and my professional requirements. They got my sizing correct for most of the pieces and my favourite from the lot being this amazing cobalt blue body-con dress and the gorgeous muted square scarf. What I also thoroughly enjoyed is this cute little pamphlet the scarf came along with it – giving ideas of different ways of wearing the same – and I must say, that is pretty thoughtful. Also, what I really appreciated about the box, is that it had products from well known brands such as “The Label Life“, “Vajor” and like others which are known for their quality of product. So no cheap bargain there. Returns & Policies – Pretty much simple to begin with and if at all you don’t like anything that comes in the box, feel free to return it and get your money back. I myself returned two of the products I received and found the whole process pretty much hassle free. All you have to do is, once you’re done trying out the products, just go on the Return Link (which will be provided by you over email) and simply click on either “Return”or “Keep” and you’re sorted. Overall, I really loved the concept around which this box works | So true to what they’re preaching – Dress With Purpose! After all, profiling your work wear is something that we all struggle with at one point in time and getting expert professionals/stylists to do it for you indeed a boon. 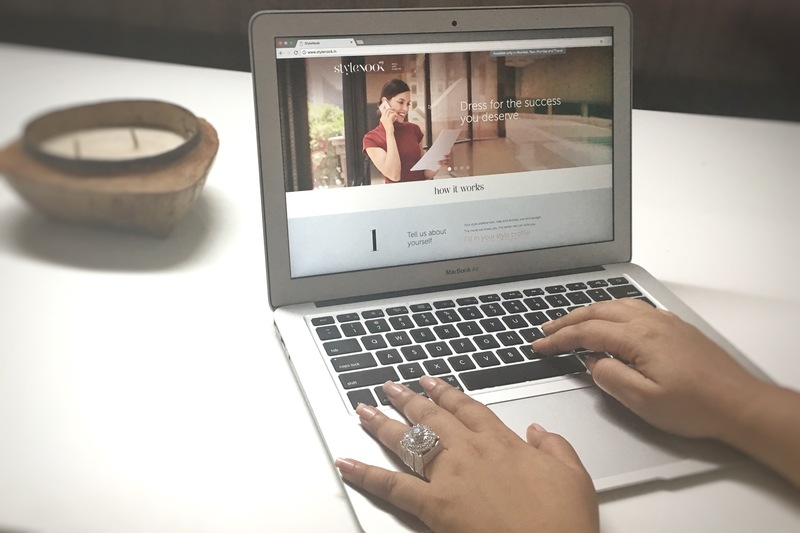 I had a personal interaction with the founder of STYLENOOK, Aarti and I totally respect her vision to develop a platform that will enable corporate women like us put our best foot forward without letting wardrobe fatigue to set in. And trust me when I say this, having worked with so many brands over my tenure as a blogger, there are not many brands/organisations out there in the market who takes Corporate Fashion for Women as seriously and passionately as StyleNook does and getting to closely work with them has been a real pleasure! Hope you guys liked this look this whole new concept as much as I did..